THE BRILLUSTRATOR: Goblin-Babies! New from Helltoys! Here is an excellent example of why I started this blog. 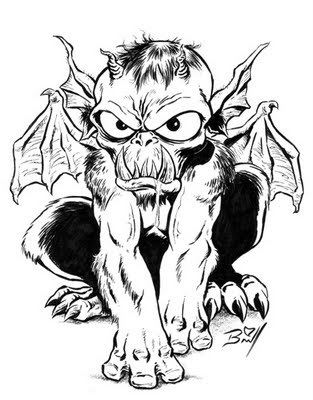 A nice little goblin sketch, done on-site at Comic Book Ink a year or so ago. But it took nearly an hour! I wasn't really hurrying, and it's not like there was a line of people wanting sketches, but if there HAD been...they would have all given up! The trick is, nice...and cool looking--but FASTER! This is NOT a speed-demon, that's for sure!